Personalities, thoughts and sometimes even a sense of humor shine through in Mari Kloeppel’s animal portraits. Ten of the artist’s works will be on display in her first museum exhibition, Animals in the Drawing Room: Portraits by Mari Kloeppel, on view at the Crocker beginning February 6. Inspired by the color, detail and draftsmanship of the old masters, such as Jan van Eyck, Albrecht Dürer and Johannes Vermeer, Kloeppel’s technique is certainly traditional, but her approach to painting animals is not. These are portraits. For each painting she studies her subjects thoroughly, looking for just the right pose and expression that captures their distinct identities. Horses are the most prominent subjects in Kloeppel’s menagerie. She also paints dogs, rabbits, chickens and cattle, along with less domesticated creatures such as ravens, pelicans and falcons. The species, however, matters less than her personal connection to the animal. She knows most of her subjects, having lived with them for years at her rural home in Elkhorn, north of the Monterey Peninsula. Others she encounters through animal rescues and local environmental activism and advocacy, efforts that often inspire her to paint the wildlife she aims to protect. 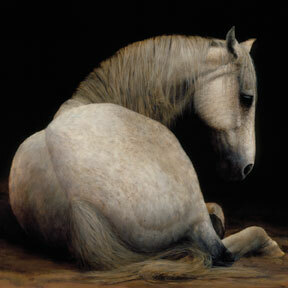 She finds beauty and intelligence in all of these animals, and within them discovers her muse. This past summer I was out at the Greens Hotel in Del Paso and noticed a charming, simple, and kind of dumb – but in a good way – piece of work in the hotel’s lobby. Recognizing elements of it as familiar from my recent grad school days as the work of fellow Hornet Steven Miller I went in for a closer gander. My suspicions were correct and I remarked at Miller’s ability to make an intriguing object out of a bunch of rubber inner tubes and a little yellow paint. That ability to transform may be the subtle brilliance in Miller’s work. 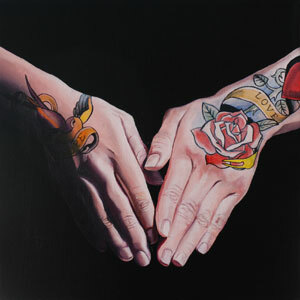 Continuing shows by two regional painters. Leaver’s dreamy paintings could be abstracts or perhaps underwater surrealism– only the artist knows for sure. Vetter describes her ghostly flower paintings as echoes. The analogy captures the wistfulness and ephemeral beauty of her sources. Internationally acclaimed artist Stephen Kaltenbach will speak about his work on February 5. Absolutely not to be missed if you care about art. February must be ‘Traditional Painters Month’ with all of the strong representational work on offer this time out. Phillipe Gandiol is a central valley transplant (originally from Paris) who works largely in the plein air tradition. His work has a 1930’s regionalist flavor and benefits from confidently placed color and assured brushwork. I like his architectural work best, and Sacto natives will recognize many of his subjects. Vicini paints out of his home base, (Livonia, Michigan) and we have no idea how Fouts found his work—but we’re glad he did. 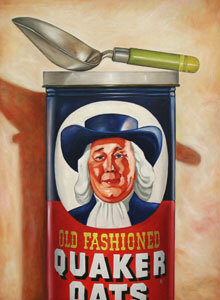 Vicini paints meticulously rendered still lifes, often of food, cookware or nostalgic food packaging. The work is beautifully executed– and fun.